Daily Mirror - SO MANY PROBLEMS, NO SOLUTIONS! 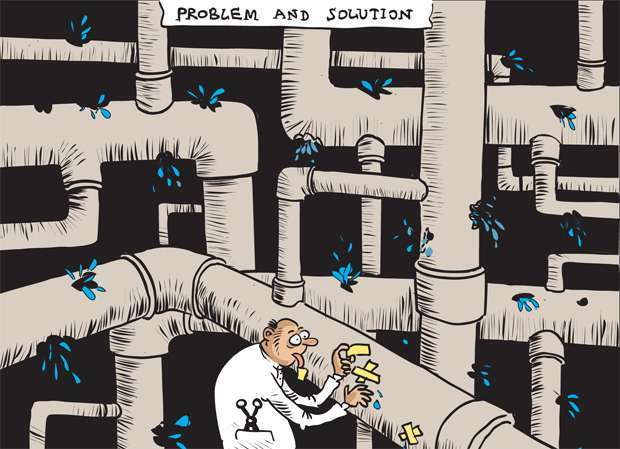 SO MANY PROBLEMS, NO SOLUTIONS! The world is upside down, utter confusion everywhere, everything around us in chaos, devastation and destruction!!! It honestly seems like the end of the world is near!!! 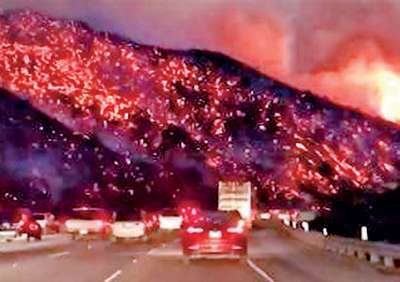 There isn’t a day we don’t hear of some gigantic natural disaster, California fires that have hardly abated, Kerala floods leaving 800,000 homeless, the pictures of the floods were horrendous, multiple quakes rock Indonesia, 350 families displaced in our own country in Nuwara Eliya!!! Into all this devastation and destruction ride the Sri Lankan heroes!!! First, we are told that MR cannot even remember who Keith Noyah is; perhaps MR needs a brainwash to help him remember or more correctly a magnified picture of Keith so the grey matter in MR’s brain can start functioning!!! That is if he has a brain!!! Amidst all this devastation, we have our ‘ME ONLY’ heroes and heroines thinking only of themselves!!! Regardless of what other people in the world are going through, it is ‘ME’ and only ‘ME’ that matters!!! We cope with a train strike, a bus strike and even a prison strike of the female prisoners!!! Into this melee comes the increase in train fares!!! After 8 years they suddenly decide it is time to raise the train fares by 15%!!! Strangely, most commuters are not against it BUT they very correctly ask why the facilities that train passengers to have to contend with are also not simultaneously improved!!! The trains themselves are filthy dirty, there is absolutely no ventilation, not a fan is working and even in an emergency, the toilets are inaccessible!!! 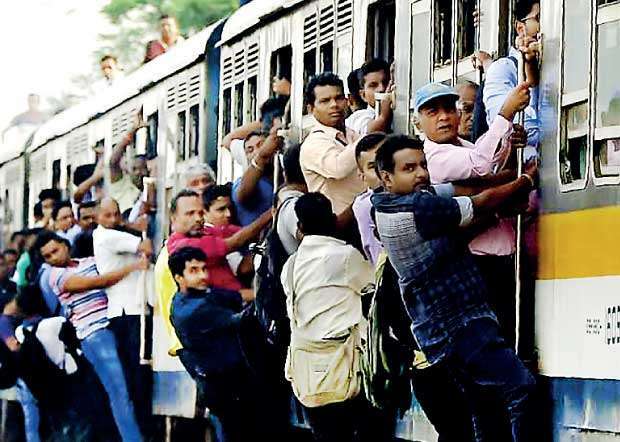 Commuters are hanging on for dear life due to lack of compartments; more often than not, a train scheduled to come in at 1:30 p.m. would likely be there 40 minutes later and that too if you are lucky!!! The commuters GRIEVANCE is there is no balance, we can accept the raise in train fares, but by the same token, give us also A PROPER SERVICE FOR THE MONEY WE ARE PAYING YOU!!! THEIR CONTENTION IS THAT BECAUSE THE DRIVERS WENT ON STRIKE TO DEMAND MORE PAY, THE POOR COMMUTERS ARE BEING ASKED TO PAY INCREASED FARE TO MEET THE DEMANDS OF THE DRIVERS!!! Strikes are not all we have to contend with in this ‘INORDINATELY SELFISH’ country of ours!!! Instead of sparing a thought for the plight of people devastated and suffering in other countries, countries that have helped us when we were dealing with devastation and destruction; our Mayor is asking for salary increases for her minions, perhaps to divert public attention away from the fact that apart from having her toilet rebuilt, she also has 18 people working for her when her predecessor managed with 6!!! What benefits has the common man, like you and I derived from the Municipal Council to which so many taxes are paid??? Additionally, we have to pay to use a public toilet, what of the poor man on the street who cannot afford to pay??? Is this what she came decked out in all her glamorous sarees for??? Adding to all this confusion and chaos, our Minister for Transport says we have to get a new fleet of buses!!! Perhaps you and I should take a walk around ALL our Bus Depots to see THE NUMBER OF BUSES LYING THERE, MOST OF THEM WITH ONLY A SMALL REPAIR NEEDED, BUT WHO NEEDS REPAIRS WHEN THE COMMISSION ON THE NEW ONES IS GREATER, SO MUCH GREATER!!! WE ARE SO SELFISHLY CONSCIOUS OF OUR COUNTRY’S NEEDS THAT WE PUT OUR OWN GREED FOR MONEY BEFORE OUR COUNTRY!!! While looking around us, let us take a little time to look at the bigger picture too!!! 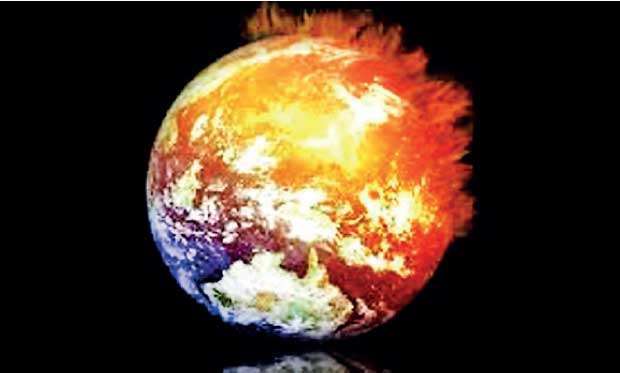 In the next 10 years, the earth will become 4 degrees hotter than it is now!!! Apparently, the Himalayan glaciers are melting at a rapid rate, therefore it is vital for all of us to lend a hand in the fight against global warming!!! Currently, computer simulations predict an increase in temperatures of over 3 degrees!!! Forest restoration is central to climate resilience!!! We need to plant more trees, NOT waste water, NOT use or burn plastics and have a clear understanding that no country in the world can fight global warming ALONE; we all have to contribute our share and that contribution and realization start now!!! We need forest conservation, preservation of the environment and careful use of water to help keep the sinister sceptre of global warming at bay!!! Today, we are living in a world where everything is CHEAP, FAST AND FAKE and I would like to reproduce here (not ad verbatim) some of the thoughts sent by a friend, which are mandatory for the benefit of planet earth!!! Society is brainwashed to admire fake bodies, just to fit into the current fashion trend, instead of appreciating the bodies we have!!! We count calories instead of counting chemicals, we don’t like to be labelled as cheap, but we certainly like buying cheap food with little or no nutrition values at all to feed our bodies!!! Without our even realizing it, we continue to slowly kill ourselves and the next generation with highly processed fake fast foods!!! Our kids today only recognize apple juice or orange juice in boxes instead of freshly squeezed juice, and they grow up knowing only all the Fast Food joints instead of Fresh Farm Foods or home cooked meals.!!! We question why REAL FOOD IS EXPENSIVE INSTEAD OF ASKING WHY FAKE FOOD IS CHEAP!!! We applaud what is termed ‘COOL’ instead of recognizing the effort that farmers work hard to give us good fresh food!!! As technology gets more advanced, people keep steadily deteriorating and getting sick!!! The majority of people around the world are dying of disease today instead of old age!!! We take medicine as food instead of food as medicine!!! When diet is wrong, medicine is of no use. And when the diet is right, there is no need for medicine!!! Spend some quality time to make a home-cooked meal; start making the right choices, practice mindful eating habits because there is no point comparing our bodies to the ones in beauty magazines, we have to start living right because each of us is unique and beautiful in our own way!!! Nutrition is the fuel and source of energy for our body!!! Don’t wait to start making changes when death is at your doorstep!!! Our body is the only temple we live in, so let’s try to make the world a better place by starting with ourselves and living healthier lives!!! Today, we need to continuously overcome challenges in an ever-changing world; we need to readjust, to constantly redefine our own sense of values and bear in mind always the significance of contributing to saving planet earth individually and with a coordinated togetherness!!! The transport minister is Deaf, Blind and dumb. He also the minister of siesta. Does know or don't want to know what's happening in his ministry. Sri Lanka a land of chaos.